My work explores the symbiotic relationship between man and the natural environment. It is important to me that I communicate my interaction with the landscape and do not produce work that is based solely on observation. I express this by using materials gathered from my garden and local fields and woodland and have developed a technique of transforming leaves and fibres into 'paper'. I am a keen gardener and, as with gardening, I work in tune with the seasons and weather. I am currently fascinated by the spiritual experience of the effect of light seen through trees. The images in my current body of work are an attempt to encapsulate this and are produced using a variety of printmaking methods including linocuts, woodcuts and screen prints onto paper made from leaves and fibres of local woodland species. I am also engaged in an ongoing collaborative project to produce a unique series of portraits of native trees etched on to their own leaves. 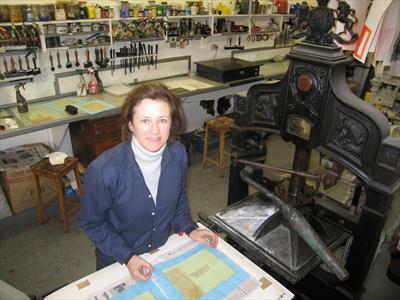 Janet French gained a BA (Hons) Art & Design – Fine Art at Colchester School of Art & Design in 2006. 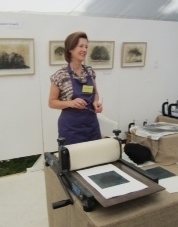 Until recently she was Joint Chair of Gainsborough’s House Printmakers and is a member of Artworks, Essex Art Society, and The Printmakers Council. Originally from London, Janet has lived in Essex for thirty years.